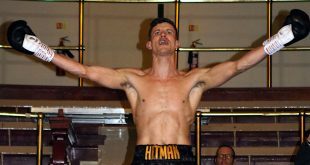 It was a real St. Patrick’s day party atmosphere at Bowlers Exhibition Centre, Manchester, last night, when James Lindemann promoted a seven card show in which Sam Hyde of Sale made short work of Croatian Tomislav Rudan – scoring a second round KO. 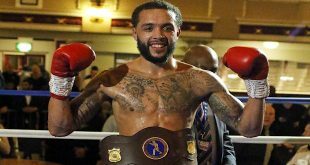 Hyde made short work of his Croatian opponent who hit the canvas twice in the second round. A body shot sent Rudan to his knees and he was counted out by Referee Sarginson. 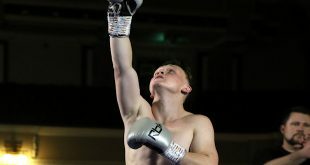 ‘The Chosen One’- Danyo started off strong and confident – putting Warburton on the back foot, but by the second half of the bout roles were reversed and, with Danyo tiring, it was Warburton pushing Danyo back. Valevski had a point deducted for holding and was on the canvas in rounds one and three. 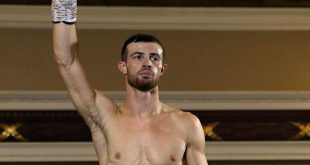 He was counted after the second knockdown but Referee Sarginson deemed the Bulgarian unable to continue and waved the contest off. Both men were throwing as many punches as they could, albeit not heavy punches, but they soon tired themselves out. Baublys sustained a nick on the left eyelid area.